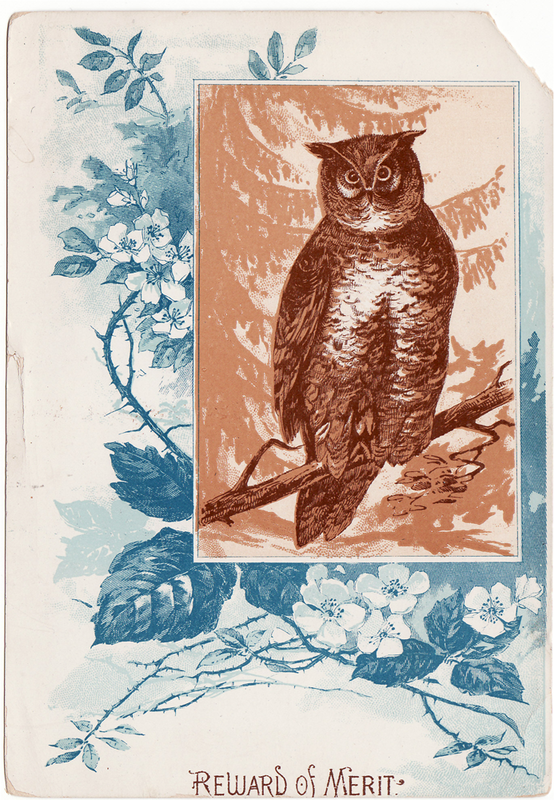 I'm eternally charmed by the fact that over a hundred years ago children and adults alike were thrilled with decorative papers as gifts and awards in the late 1800 and early 1900s. I guess it isn't that different than kids today getting stickers, but I still find it remarkable that pretty cards and cut-outs were treasured so much that children and adults kept them for their whole lives. Today you can still find them and often in great condition because of how much they were treasured. An Award of Merit was one of the first pieces of ephemera I got. I found it at an old bookstore in Oakland in the late 80's and kept it displayed in my house for a long time. Most Rewards of Merit are about 3.5 x 5, some are smaller like a business card and some are larger like a 5x7 size. This one below is large and a unique image for a Rewards of Merit card. It just says the name Ethel on the back. I listed some of my collection of Reward of Merit cards in the Etsy shop today. This is so much better than a sticker. I think we should bring back the reward of merit!